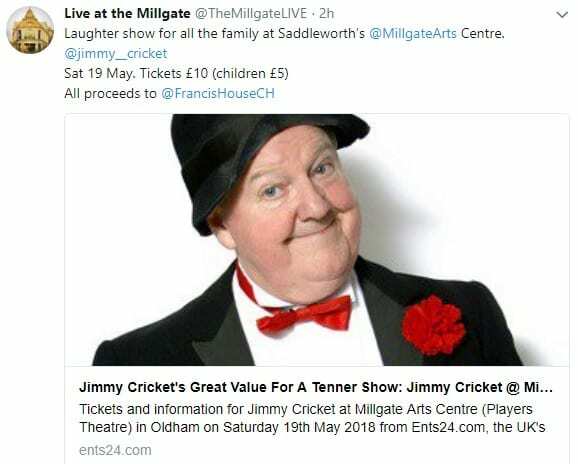 Jimmy Cricket will be taking his Great Value For A Tenner show to Oldham later in the year. 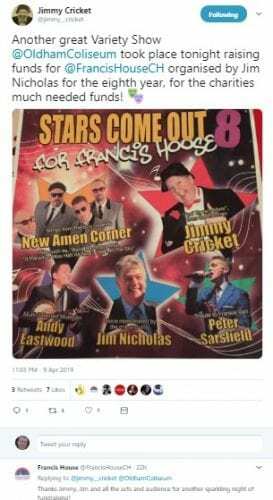 All proceeds from the family show at the Millgate Arts Centre (Players Theatre) in Saddleworth on Saturday 19 May (7.30pm start) will go to Francis House Children’s Hospice, one of Jimmy’s favourite charities. Tickets will be £10 and £5 for children. Millgate Arts Centre is home to a thriving local arts community, providing a base for theatre, film, and chamber concert societies, as well as holding art exhibitions and being available for business or personal lettings. 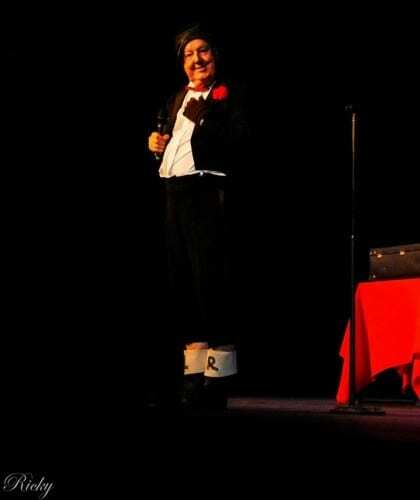 The official promotion for the laughter show in May says: “The much-loved Irish comedian, Jimmy Cricket, brings his family-friendly comedy show for just a tenner to the Millgate Arts Centre. “Jimmy will arrive equipped with one-liners galore, a sprinkling of visual comedy and, yes, that ever present letter from his mammy! 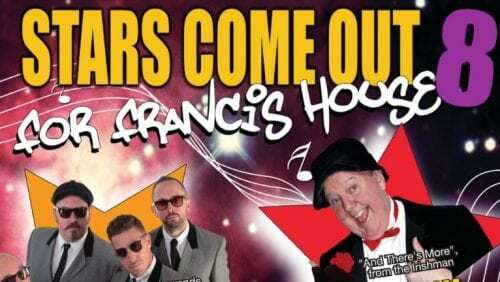 This is the perfect show for granny and grandchild alike, as there will be giggles aplenty during an evening of fun and frivolity. Ticket information: Bookings can be made in person, by phone or online. The box office (at Delph Library) is open Tuesdays 2pm–5pm; Wednesdays 2pm–7pm; Thursdays 1pm-6pm and Fridays & Saturdays from 9.30am–1pm. The box office at Delph Library telephone number is 01457 874644. Tickets must be paid for at the time of booking, and we accept payment using all major credit and debit cards. You can select your seats at the time of booking. Tickets are non-refundable. 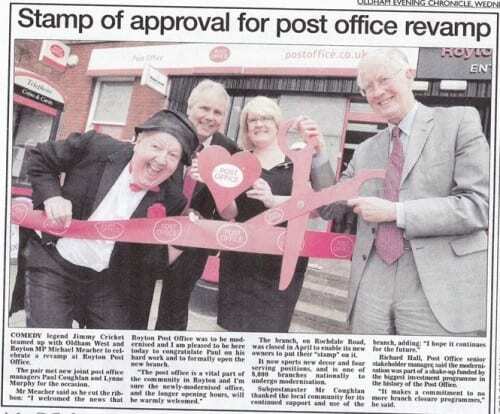 Jimmy Cricket was only too pleased to help out an old friend at the reopening of a post office in Greater Manchester earlier this summer. The famous Northern Ireland entertainer was invited to the special event in Oldham by Paul Couglan, who is the new franchise owner of the revamped Royton Post Office. Paul, an acquaintance of Jimmy, already runs a successful post office at nearby Moston in north Manchester. Also present at the relaunch was Michael Meacher, a British Labour politician who has been the Member of Parliament for Oldham West and Royton since 1997. Jimmy said: ” I was thrilled to be able to support Paul at the start of his new venture. He has always tried to support me over the years with his new musicals and shows. The event was featured in the 18 June edition of the Oldham Evening Chronicle (see image above).